FROM THE MIND OF TOM BELAND: photos from san diego! I got the chance to meet Jeff Smith, the creator of BONE and one of my influences. What a great guy. I admit, I had a fanboy geek-out experience here. Jeff's linework... man, where do I begin? It's the smoothest linework in the business. BONE was an amazing experience to read in black and white and when it was announced that the series would be reprinted in color, I think we all thought "NOOOOO!!" I think we were all afraid it would come off as one of those Turner Classics colorizations. Steve Hamaker's coloring on BONE has brought what was already an awesome series to new wonderful heights. Ugh. I could go on forever on how lovely those pages look in color. He's my new hero. Anyhoo... Jeff was more than kind in person and he signed the hardcover ART OF BONE book I picked up and even drew a nice Phone Bone too! We shared a few laughs and then he had to go. I was a happy, happy cartoonist for the rest of the day. My friend, Tom Fuller went to his first San Diego Con last year and had the time of his life. This year he brought his family with him and they got to experience it too. His wife, Kellie, who's never read a comic book in her life, wants the family to dress up in costume next year. This is Wayne Beamer. Every now and then, you get a reader who you connect with and become wonderful friends with. Wayne is one of those readers. He's a great guy and we have wayyyyy too much in common. A fellow NFL fan, we often email each other during the season. Stephen Notely of BOB THE ANGRY FLOWER fame. Love him. Ask him some time about his wrestling match with a homeless guy. 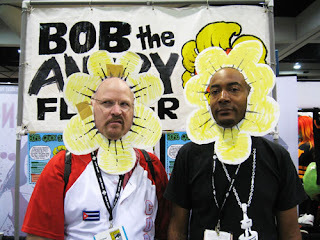 Keith Knight (K. CHRONICLES) and I slapped on the mighty Bob petals and tried to be angry flowers. Keith just recently won a Harvey Award and, really... it couldn't have gone to a nicer and more deserving guy. Very proud. This is Erik Larsen. He runs Image Comics and he's a big-time comics pro. To say I was terrified sitting next to him is an understatement. It's very difficult for me to feel relaxed around Erik. I can't seem to drop the "I'm a huge fan" part of me and be a part of the party. I'm hoping that will change in time, because I think he's amazing to hang with. When I talk to him, I feel more like I'm taking up his time and it never feels natural. This isn't an Erik thing... it's a Tom Beland thing. I think I'm very intimidated by the creators, in general, at Image. I still see myself as this mini-comic dude who got invited to a party with these people. They have all these amazing books and these far-out ideas and, at times, I feel somewhat tiny with my little romance book. I'm still learning to be comfortable there. To his credit, Erik will always talk about technical stuff with me. Whether it's tools to use or coloring critiques, the man genuinely cares about the people at Image. Scott Kurtz, creator of PVP. He knows so much about the business and I know squat. He's someone else I'd love to sit back and hang with, but I'm far too intimidated to relax. I'd love to be able to pick his brain and crack him up. His speech at the Eisners last year was very emotional. I know he doesn't like hearing about how emotional he was, but it was probably the most moving Eisner speech I can remember hearing. His podcast with Kris is perfection. His debates with Kris are when the show is at its best. Scott's willingness to broadcast those arguements, while not always being the one who is right... says alot about Scott as a person. It's also great when his wife calls in. Golden stuff. Mike and I (from the Comic Book Noise family) totally geeked out at meeting you. That had to be the best experience of the whole Con for us. I finished reading Postcards on the plane back to Colorado and absolutely LOVED it! I just couldn't stop reading it. Of course your story had me in tears at the airport! What a wonderful concept of a book. Mike is giving away a copy for the logo contest they had for his Geek Brunch podcast. If you ever have a couple of hours to spend listening to a couple of guys talk a lot about comics, food, TV and movies you should check it out. It's under the Comic Book Noise family of podcasts. Glad you and Lily are doing well. Oh, and we have the picture of you, me, and Mike at the Con. Would you like me to email a copy to you? Just let me know. Take care!! I'll check out the podcast today. Very glad to hear you enjoyed POSTCARDS. It was a great thing to be a part of... a very special book. TOMBELAND.COM is open for business!!! ARE YOU KIDDING ME?? 45?? ?